Tom Stokes in action for Panthers against Ipswich. Peterborough Panthers promoter Ged Rathbone has defended his decision to drop a rider after only one meeting. The table-topping city club have released reserve Tom Stokes in favour of signing Czech talent Zdenek Holub. Stokes, whose father John rode for Panthers in the late 1980s, failed to score in a League Cup clash against Ipswich almost a fortnight ago. He then missed the club’s two Bank Holiday Monday successes against Scunthorpe and Ipswich in the Premier League due to illness before being replaced by Holub yesterday. 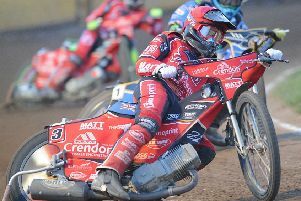 Rathbone said: “We wanted to give Tom the opportunity to race in the Premier League as he was our number eight, but it was clear to me it was a little too soon for him. “It gave Tom a feel of what is required to step up to the next level from the National League and that was also the case for Luke Chessell, when he guested for us on Bank Holiday Monday. “We’ve spoken to Tom in depth and have created a support package for the future of his career. He is not a rider we are simply going to forget about and he will still have strong links with the club going forward. While Rathbone is a big supporter of developing British riders, he stresses that Panthers are in a results-based business. And he believes the capture of Holub will greatly boost their chances of silverware in the current Premier League season. They went four points clear at the top of the Premier League courtesy of their two Monday triumphs, but that gap could be slashed tonight if Sheffield beat Workington. Rathbone added: “We are a professional sports team and we have to track the best possible one-to-seven that we can. “It was a no-brainer to bring Zdenek make the move and while it might upset some people, I’ll always make what I feel is the best decision for the club. “We have to compete with some very strong clubs and I feel we now have seven riders who are all capable of scoring double-figures.